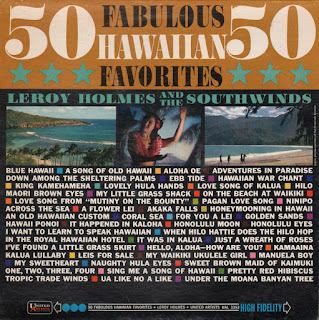 One of a series of UA albums featuring "50" songs (medleys) on disc packaged inside jackets that were produced with similar cover treatments. 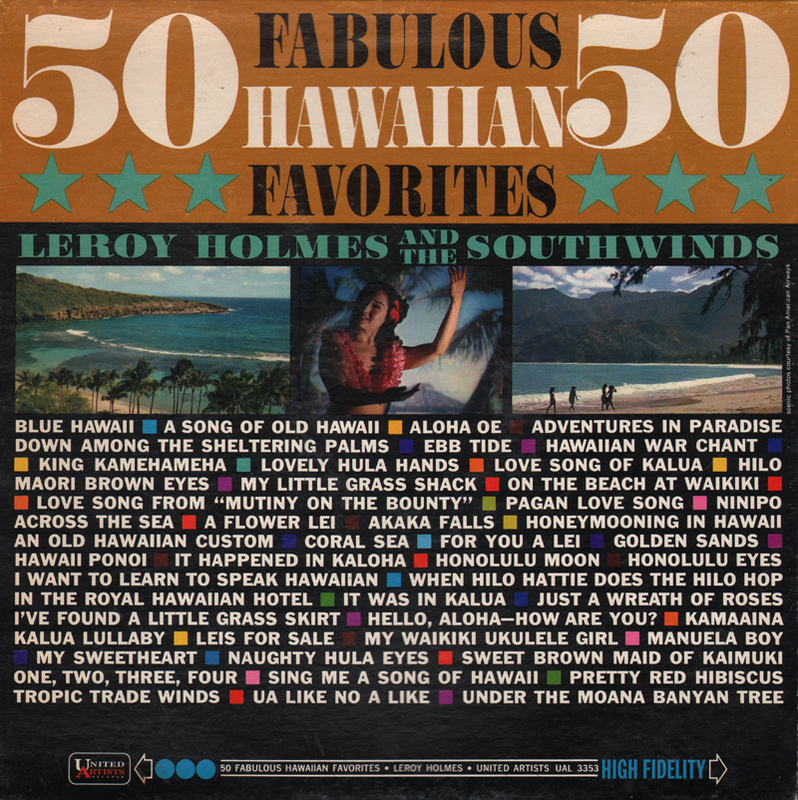 From Billboard - April 11, 1964: Hawaiian music gets a striking showcasing in this roundup of 50 songs of and about the islands by Leroy Holmes. The maestro see to it that rhythms sway and chart the tempo enchants and it's to his credit that the Hawaiian load never gets tiresome. This is another Dan & Dale collection of creative small combo lounge-styled arrangements highlighted by their period light-pop guitar sound. 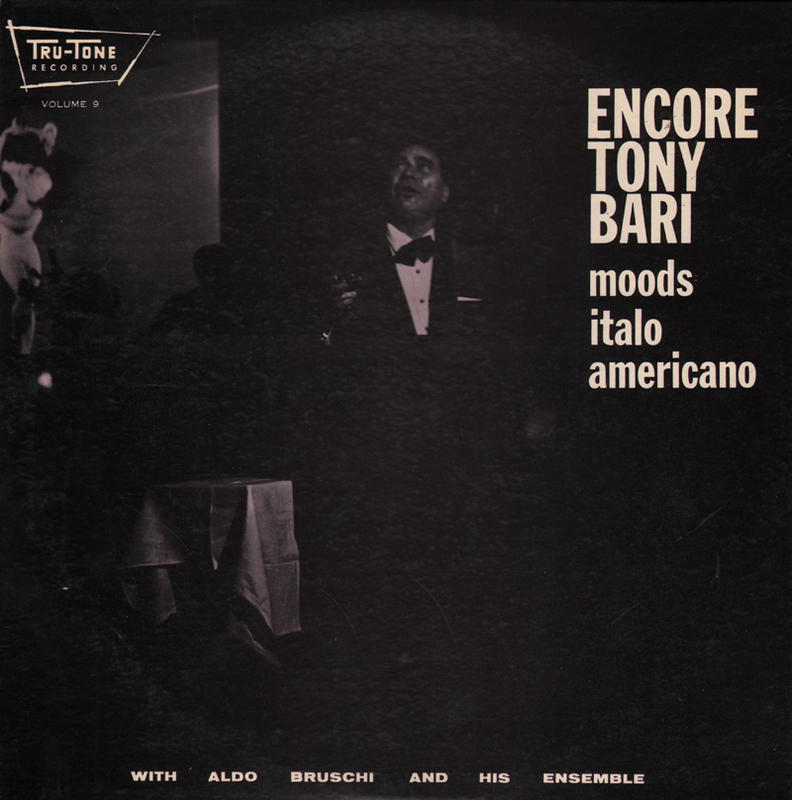 From the back cover: Tony Bari appreciates the warm enthusiasm show by his many friends, for his last album "Moods Italo-Americano"
Aldo Bruschi, Arranger and Conductor of "Encore" began his musical career at the age of eight. Mr. Bruschi is a graduate of The Juilliard School of Music and excels in the Oboe, Piano, and Accordion. He is currently appearing with his unique ensemble at the chic supper club "In Boboli" in New York City. Outstanding project from one of my favorite artists, Almeida. From Billboard - June 23, 1958: Indie producer-actor Cornel Wilde hired noted classical guitarist Laurindo Almeida to penn the score for this lensed-in-South-America film; the result is an off-beat and very listenable brand of movie music, built for the most part around the guitar around the guitar work backed by rhythm combos. 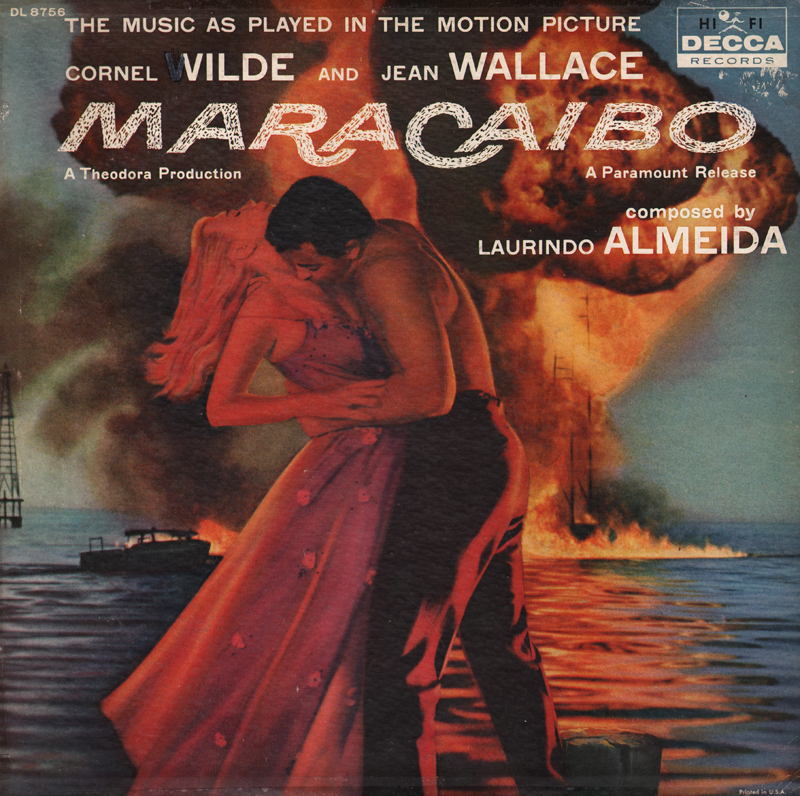 One concession to movie commercialism: a routine title tune sung (with ork) by Jean Wallace which merely subtract from the rest of the album. 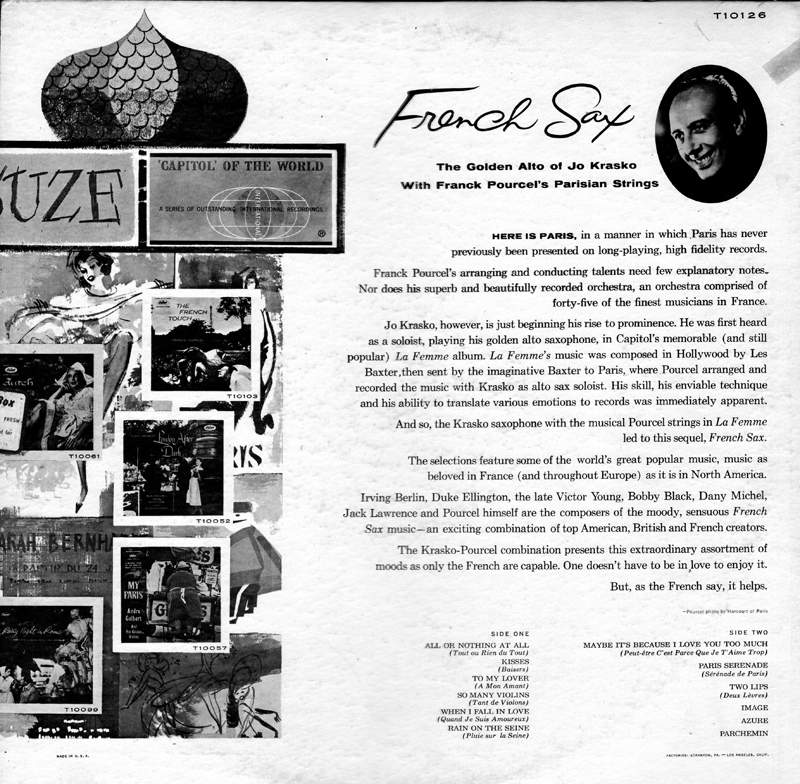 From the back cover: Almedia was immediately enthusiastic about the whole project. He suggested that in many portions of the score we should have two and three guitars, and, as a result, we used very few instruments aside from the guitar; accordion, bass, trumpet, piano and drums. With these in various combinations, amazing effects were achieved in a score requiring enormous range of mood. 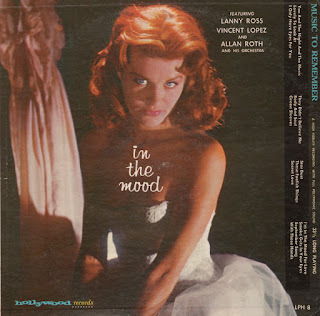 The arrangements rise slightly above the traditional 50s "gypsy" orchestral project, helped along by occasionally adding a touch of space age swing/mood. The sample is the only track to feature any type of vocal. From the back cover: Irwin Halletz, born in Vienna, was six when he began studying music. His first instrument was the violin. At fourteen, he entered the Vienna Music School (Musikakademie), where he concentrated on theory, piano and clarinet. From this point on, young Irwin was financially on his own, earning his living through piano lessons and entertaining at cabarets. In the course of his subsequent career, he has conducted a radio dance orchestra, arranged for the Hors Winter orchestra and toured Europe with his own show orchestra. In addition, he has composed, arranged and conducted the scores for twenty motion pictures. 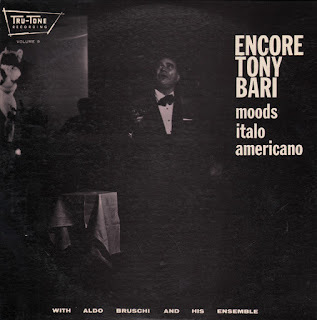 From Billboard - November 24, 1958: Lush instrumental versions of Hungarian favorites more for listening than dancing. Photo by Photo International, Inc.
From the back cover: Being raised in a trunk (see front cover) is not a new experience for Bobbie Baker. Bobbi was raised in the true tradition of show business, backstage at the Palace Theater in New York, where her father played lead trumpet with the pit band. Her grandmother was a snake charmer with P.T. Barnum Circus and her mother was a singer and dancer. 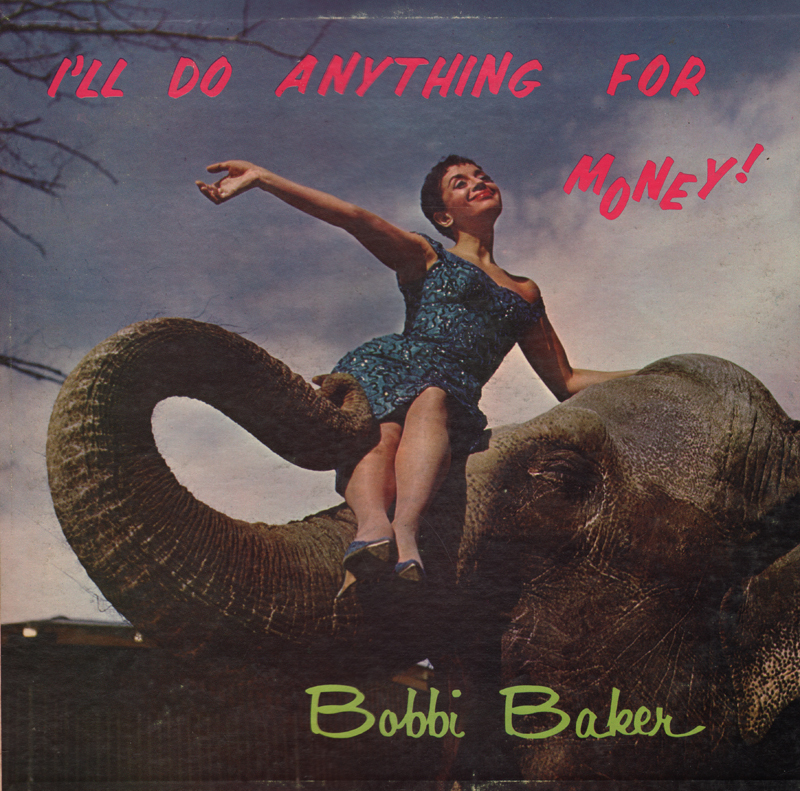 From Billboard - November 7, 1960: Bobbi Baker is a comic who also sings now and then, somewhat in the manner of Sophie Tucker. Her monologs are somewhat on the order of Sophie Tucker, too, a bit raucus and a bit rowdy as well. Her comedy is board and night-clubby, and altho it doesn't had the appeal of a Shelly Berman, some will enjoy it. 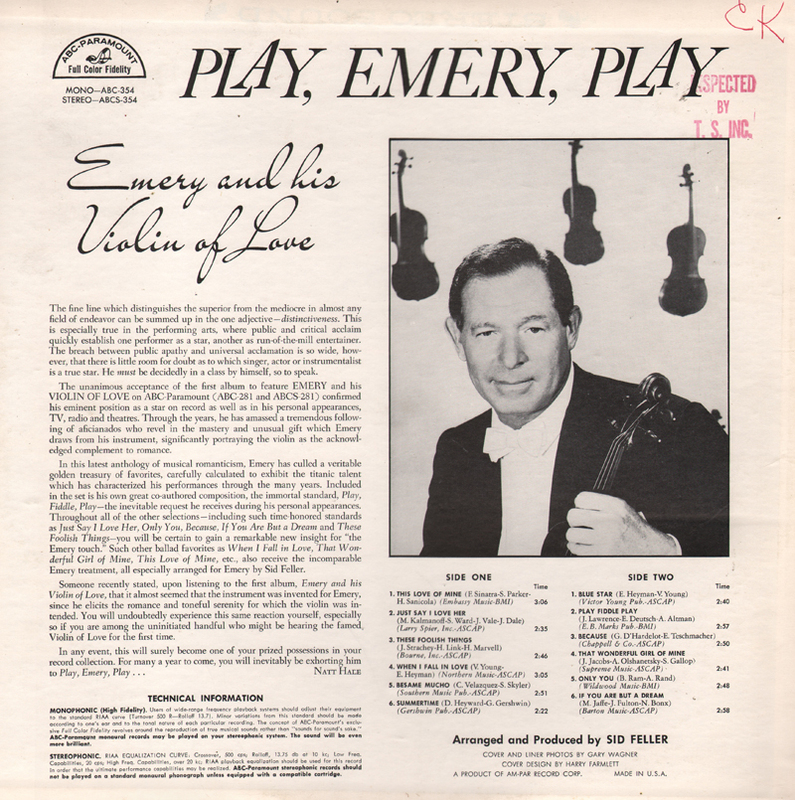 Emery is referred to by his first name only on the jacket. 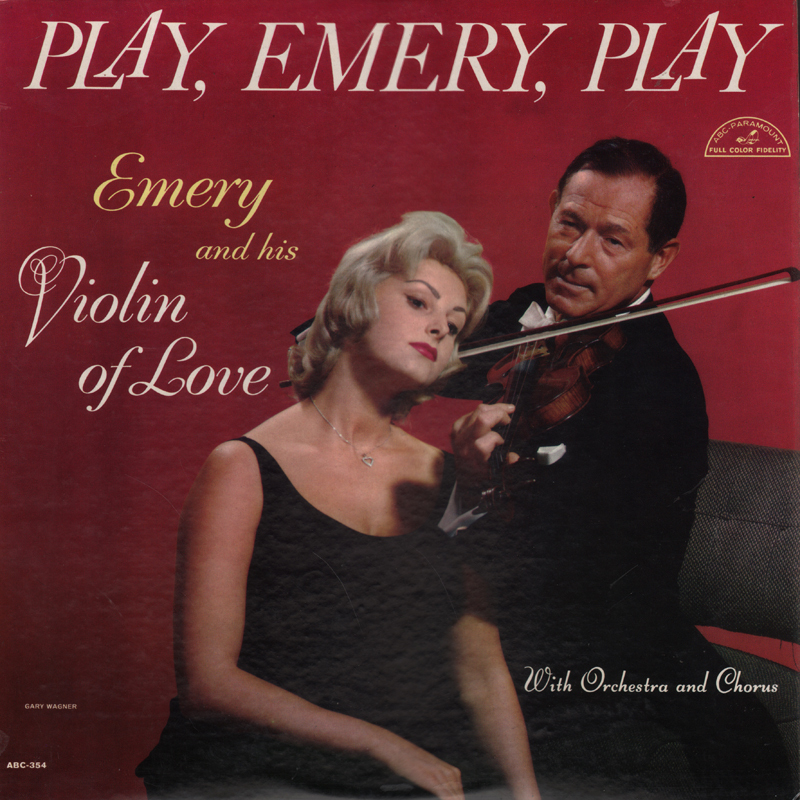 This is Emery's (Emery Deutsch) follow-up release to his 1960 Paramount ABC-281 press "Emery And His Violin Of Love". Surprisingly tasty space age arrangements back up the cutting, but more traditional, sound of Emery's violin. Somehow the approach works. Terrific engineering. 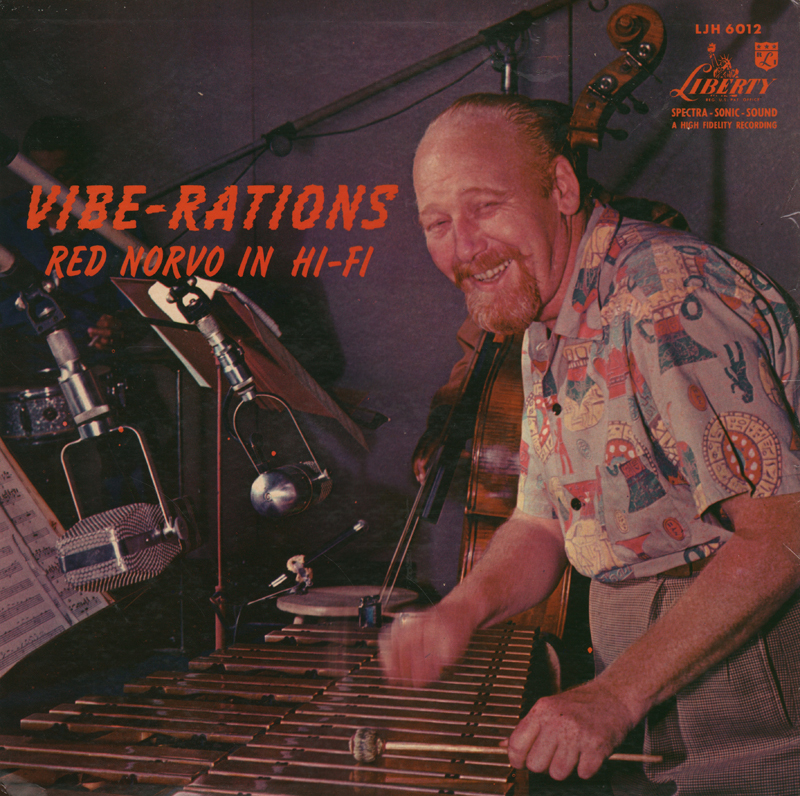 From Billboard - December 22, 1956: There's some good Norvo vibes here, but hardly enough. Actually, the set has only 15 minutes to each 12-inch side, which is about half of what some companies are offering. There is some interesting two-flute support, but this becomes stiff when the English horn – a most unswinging instrument – is added. Some good flashes by the late Bill Dillard on guitar, and an excellent cover that will help sales considerably. Well… what a grumpy Billboard review. Yeah… Norvo and Liberty could have stuffed another track on each side… but I hardly think record buyers would have noticed. I've seen many 12 inch discs from this period that are more short on material than this one. And the remark about the English Horn is awfully picky. The sample above, I believe, features the subtle horn passage. The arrangement sounds good to me as does the entire set. 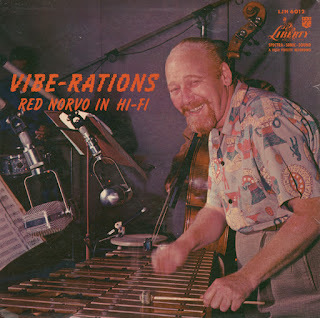 From the back cover: In the summer of 1956 when I (Richard Gehman) was in Hollywood on some magazine jobs, I went to hear him (Norvo) every night I could make it at Ken Brown's place in Santa Monica. I would sit there marveling as he played "Rhee! Oh Rhee!" (my favorite) and the rest, and between sets we would sit around and talk about the days seven or eight years ago when he was playing at the Embers in New York and after hours hd and I and Eddie Condon would go to a Chinese restaurant where the proprietor would bring us a teapot full of what Condon always called "slant-eyed whisky." 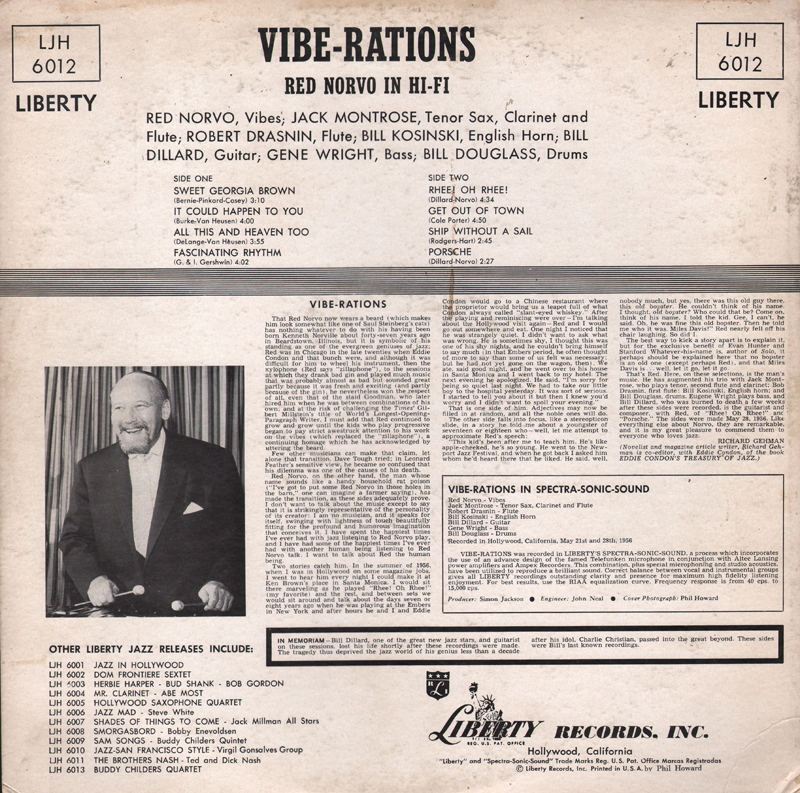 After the playing and reminiscing were over – I'm talking about the Hollywood visit again – Red and I would go out somewhere and eat. One night I noticed that he was strangely quite. I didn't want to ask what was wrong. He is sometimes shy, I thought this was one of his shy nights, and he couldn't bring himself to say much (in that Embers period, he often thought of more to say than some of us felt was necessary; but he had not yet gone on the wagon, then) We ate, said good night, and he went over to his house in Santa Monica and I went back to my hotel. The next evening he apologized. He said, "I'm sorry for being so quiet last night. We had to take our little boy to the hospital yesterday. It was sort of serious. I started to tell you about it but then I knew you'd worry and I didn't want to spoil your evening." That is one side of him. Adjectives may now be filled in at random, and all the noble one will do. Also, this note from the back cover: Bill Dillard, one of the great new jazz stars, and guitarist on these sessions, lost his life shortly after these recordings were made. The tragedy thus deprived the jazz world of his genius less than a decade after his idol, Charlie Christian, passed into the great beyond. These sides were Bill's last known recordings. Budget compilation featuring a spicy cover to help get you in the mood while you listen to the lackluster set. 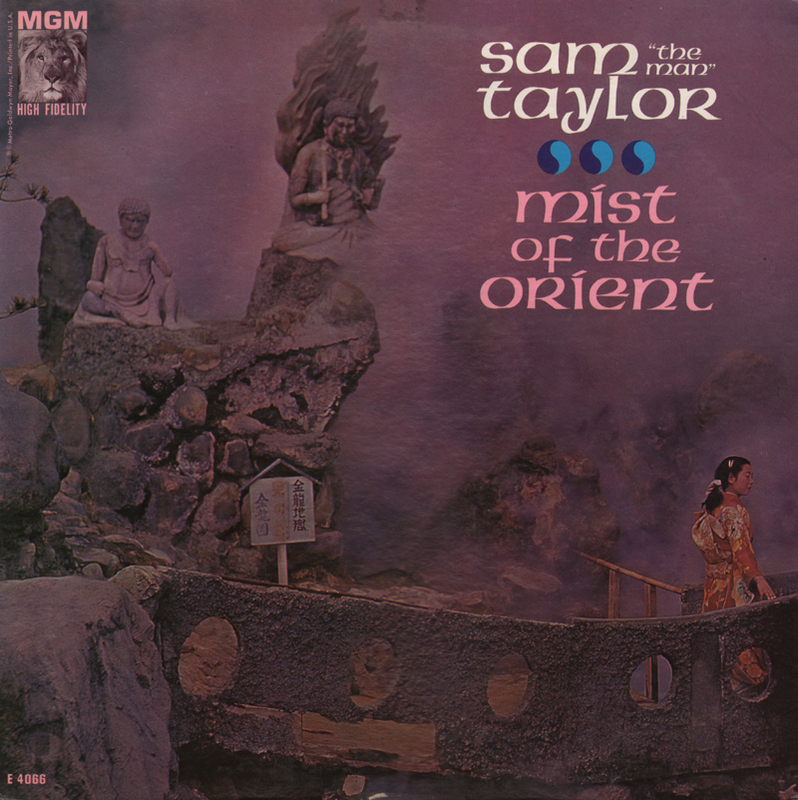 Based on the terrific cover design, the set is thematically inconsistent if you expect to hear a complete collection of tunes arranged with an "oriental" twist. With that said, the sound is classic Taylor and Billboard loved the LP, giving it "4 Stars". 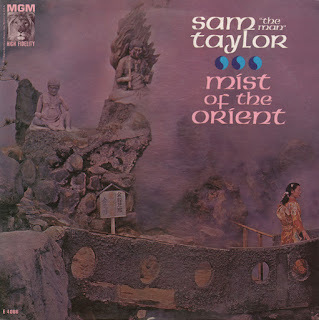 From Billboard - September 1, 1962: The tenor sax man with the big sound is back playing a variety of material recorded in Japan. The LP contains a number of Japanese songs and a wide-ranging group of standards. He is accompanied by a large string ork and organ and piano on some tracks. The music is lush, with the healthy tenor sound nicely placed in the arrangements. From the back cover: Taylor, who was born in Lexington, Tenn., in 1918, applied himself seriously to music while still a boy in school. He learned the clarinet and alto sax, then changed to tenor, his specialty. He played tenor in his school band. I 1938 he joined Sherman (Seatman) Crothers in Akron, O. Later he played with the Sunset Royal Entertainers, the Cootie Williams Orchestra, and the Cab Calloway Orchestra. He has toured extensively and made many TV and theater appearances. In the recording files, of course, he is a staple – in demand not only for albums of his own, but also for sessions by other stars who are anxious to avail themselves of his skill with the tenor sax. From the back cover: Jo Krasko, however, is just beginning his rise to prominence. He was first heard as a soloist, playing his golden alto saxophone, in Capitol's memorable (and still popular) La Femme album. 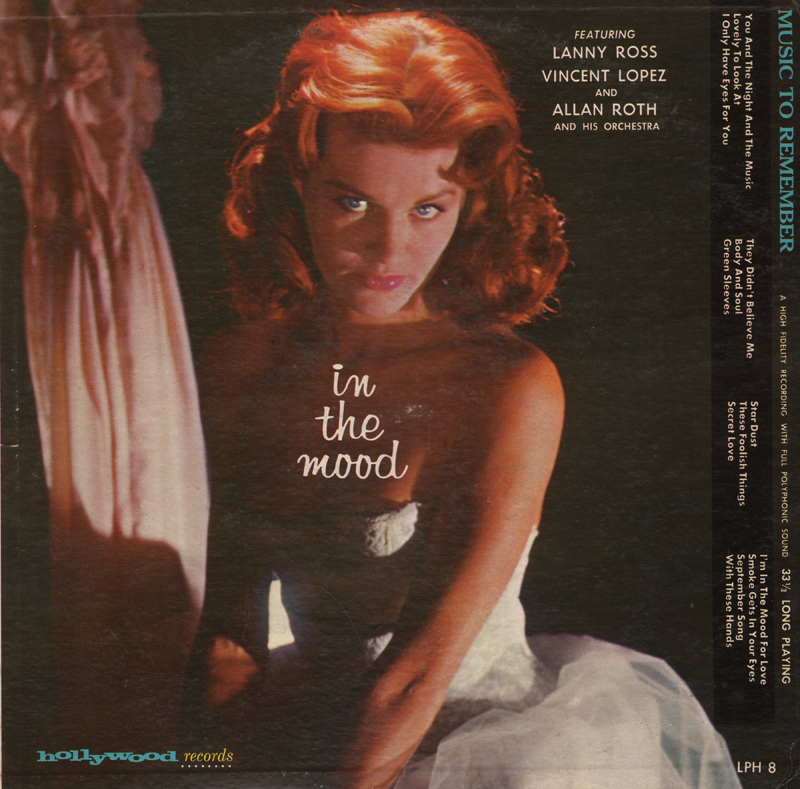 La Femme's music was composed in Hollywood by Les Baxter, then sent by the imaginative Baxter to Paris, where Pourcel arranged and recorded the music with Krasko as alto sax soloist. His skill, his enviable technique and his ability to translate various emotions to records was immediately apparent. 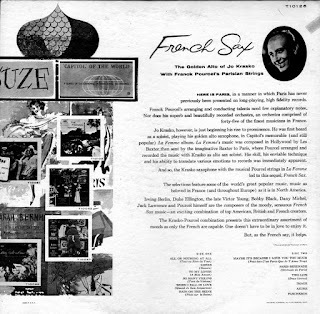 And so, the Krasko saxophone with the musical Pourcel strings in La Femme led to this sequel, French Sax.